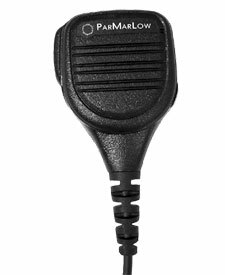 SM-1100 Speaker Microphones are rugged, weatherproof units with an integral audio earphone plug. The SM-1100 comes standard with rotating clothing clip, coil cord wired to the specific mating connector for your radio and a 3.5mm earphone plug. An earphone with the 3.5mm jack and 18 cable is the perfect mate for the SM-1100.